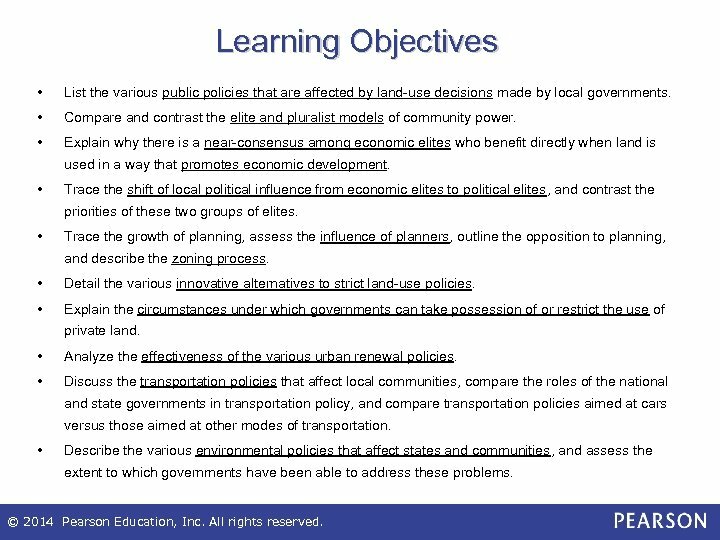 Learning Objectives • List the various public policies that are affected by land-use decisions made by local governments. • Compare and contrast the elite and pluralist models of community power. • Explain why there is a near-consensus among economic elites who benefit directly when land is used in a way that promotes economic development. • Trace the shift of local political influence from economic elites to political elites, and contrast the priorities of these two groups of elites. • Trace the growth of planning, assess the influence of planners, outline the opposition to planning, and describe the zoning process. • Detail the various innovative alternatives to strict land-use policies. • Explain the circumstances under which governments can take possession of or restrict the use of private land. • Analyze the effectiveness of the various urban renewal policies. 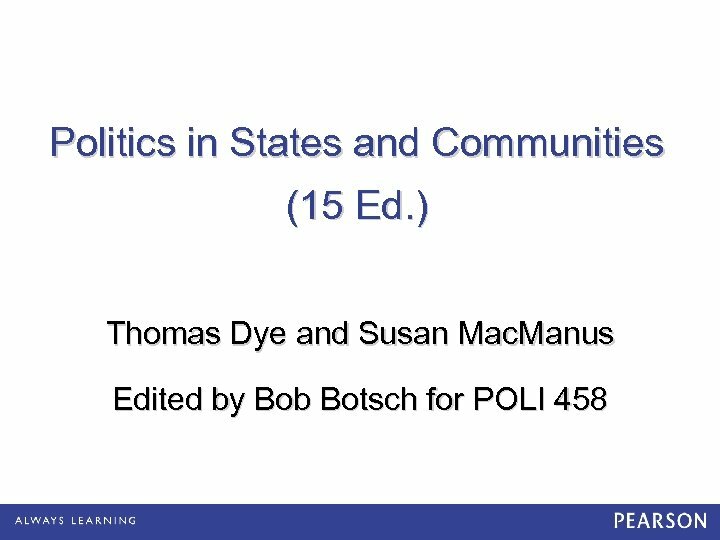 • Discuss the transportation policies that affect local communities, compare the roles of the national and state governments in transportation policy, and compare transportation policies aimed at cars versus those aimed at other modes of transportation. • Describe the various environmental policies that affect states and communities, and assess the extent to which governments have been able to address these problems. © 2014 Pearson Education, Inc. All rights reserved. 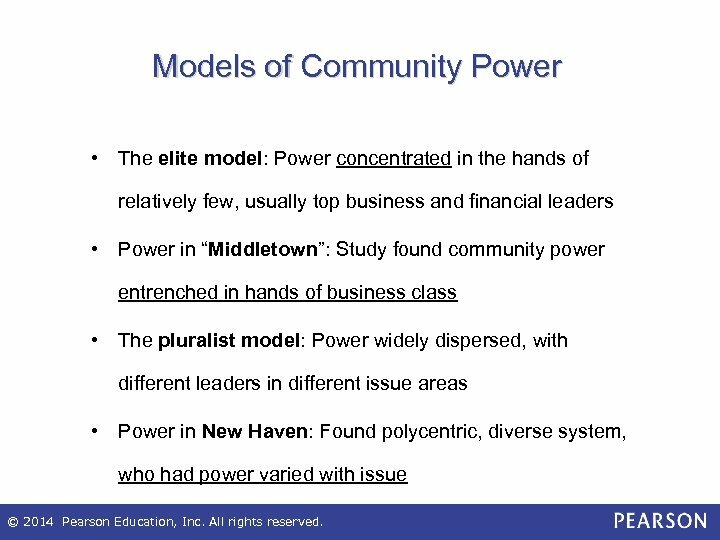 Models of Community Power • The elite model: Power concentrated in the hands of relatively few, usually top business and financial leaders • Power in “Middletown”: Study found community power entrenched in hands of business class • The pluralist model: Power widely dispersed, with different leaders in different issue areas • Power in New Haven: Found polycentric, diverse system, who had power varied with issue © 2014 Pearson Education, Inc. All rights reserved. 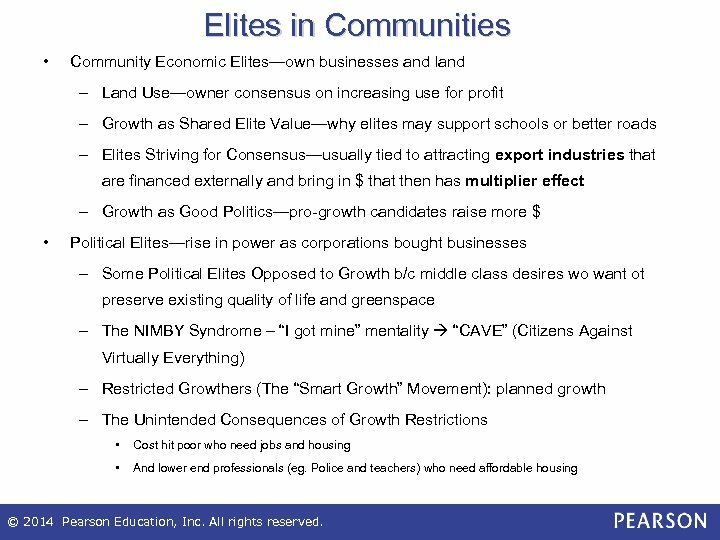 Elites in Communities • Community Economic Elites—own businesses and land – Land Use—owner consensus on increasing use for profit – Growth as Shared Elite Value—why elites may support schools or better roads – Elites Striving for Consensus—usually tied to attracting export industries that are financed externally and bring in $ that then has multiplier effect – Growth as Good Politics—pro-growth candidates raise more $ • Political Elites—rise in power as corporations bought businesses – Some Political Elites Opposed to Growth b/c middle class desires wo want ot preserve existing quality of life and greenspace – The NIMBY Syndrome – “I got mine” mentality “CAVE” (Citizens Against Virtually Everything) – Restricted Growthers (The “Smart Growth” Movement): planned growth – The Unintended Consequences of Growth Restrictions • Cost hit poor who need jobs and housing • And lower end professionals (eg. Police and teachers) who need affordable housing © 2014 Pearson Education, Inc. All rights reserved. 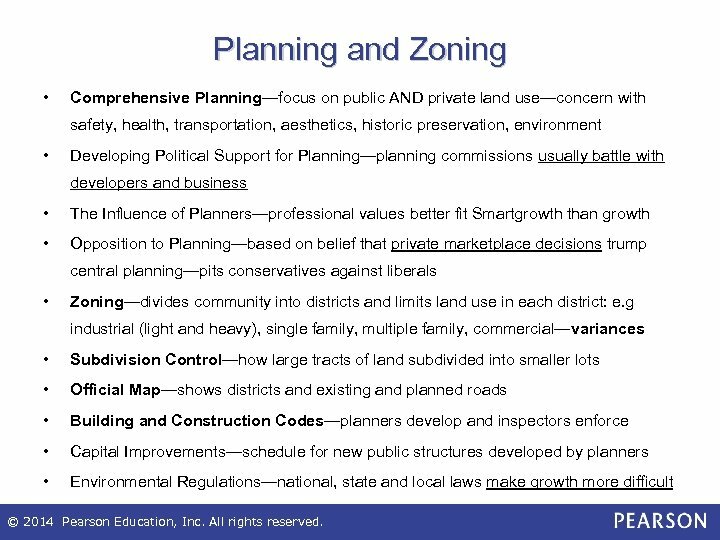 Planning and Zoning • Comprehensive Planning—focus on public AND private land use—concern with safety, health, transportation, aesthetics, historic preservation, environment • Developing Political Support for Planning—planning commissions usually battle with developers and business • The Influence of Planners—professional values better fit Smartgrowth than growth • Opposition to Planning—based on belief that private marketplace decisions trump central planning—pits conservatives against liberals • Zoning—divides community into districts and limits land use in each district: e. g industrial (light and heavy), single family, multiple family, commercial—variances • Subdivision Control—how large tracts of land subdivided into smaller lots • Official Map—shows districts and existing and planned roads • Building and Construction Codes—planners develop and inspectors enforce • Capital Improvements—schedule for new public structures developed by planners • Environmental Regulations—national, state and local laws make growth more difficult © 2014 Pearson Education, Inc. All rights reserved. 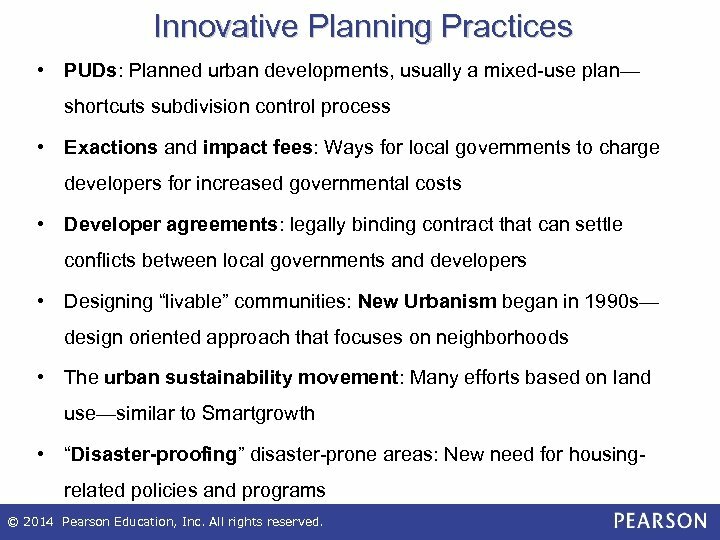 Innovative Planning Practices • PUDs: Planned urban developments, usually a mixed-use plan— shortcuts subdivision control process • Exactions and impact fees: Ways for local governments to charge developers for increased governmental costs • Developer agreements: legally binding contract that can settle conflicts between local governments and developers • Designing “livable” communities: New Urbanism began in 1990 s— design oriented approach that focuses on neighborhoods • The urban sustainability movement: Many efforts based on land use—similar to Smartgrowth • “Disaster-proofing” disaster-prone areas: New need for housingrelated policies and programs © 2014 Pearson Education, Inc. All rights reserved. The Takings Clause Eminent domain is the judicial process by which government can take private property for public use by providing fair (just) compensation, as determined by the 5 th Amendment’s “Takings” Clause. Use often relates to transportation, schools, sewers, economic development. • “Takings”—When do cities go too far? How far can government go in regulating land use without compensating property owners? What % loss is too much? • “Takings” for private use (economic development)? Controversial New London, Connecticut case: Supreme Court said governments can use eminent domain to take privately owned land turn it over to private developers to generate more property taxes © 2014 Pearson Education, Inc. All rights reserved. 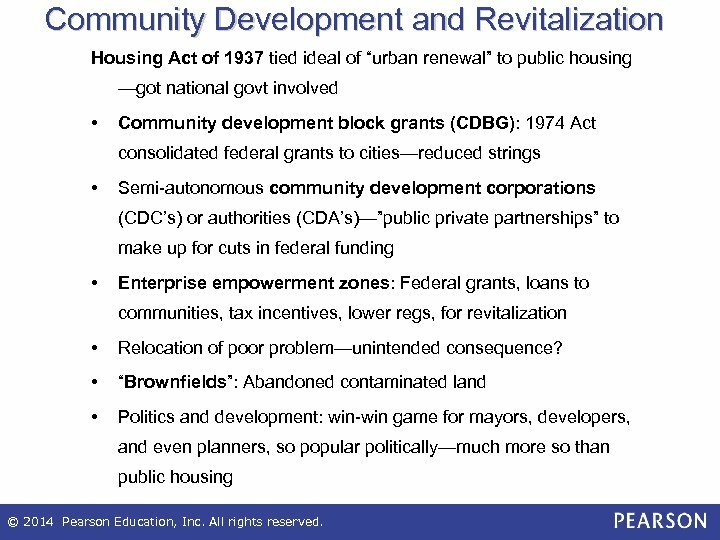 Community Development and Revitalization Housing Act of 1937 tied ideal of “urban renewal” to public housing —got national govt involved • Community development block grants (CDBG): 1974 Act consolidated federal grants to cities—reduced strings • Semi-autonomous community development corporations (CDC’s) or authorities (CDA’s)—”public private partnerships” to make up for cuts in federal funding • Enterprise empowerment zones: Federal grants, loans to communities, tax incentives, lower regs, for revitalization • Relocation of poor problem—unintended consequence? 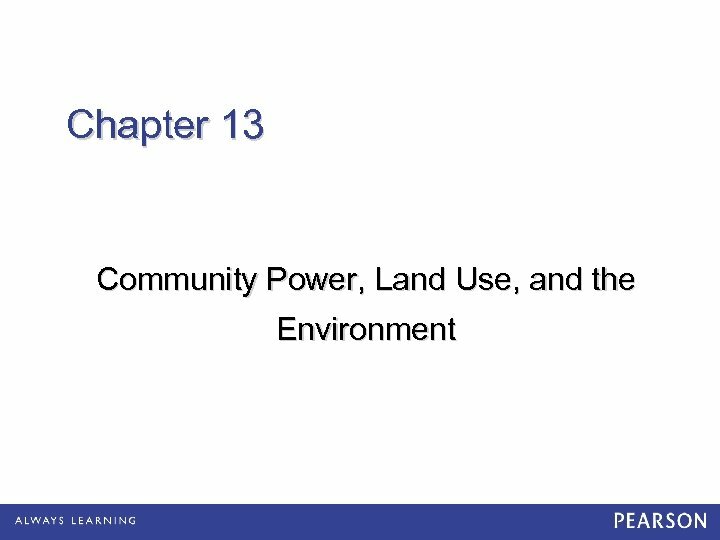 • “Brownfields”: Abandoned contaminated land • Politics and development: win-win game for mayors, developers, and even planners, so popular politically—much more so than public housing © 2014 Pearson Education, Inc. All rights reserved. 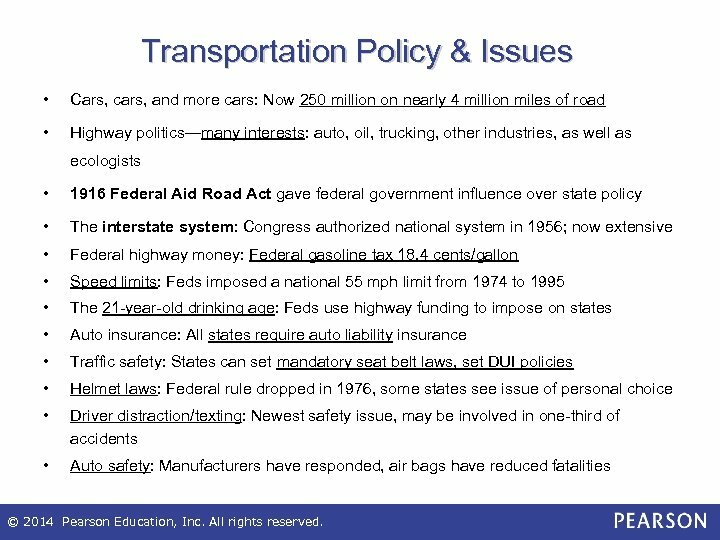 Transportation Policy & Issues • Cars, cars, and more cars: Now 250 million on nearly 4 million miles of road • Highway politics—many interests: auto, oil, trucking, other industries, as well as ecologists • 1916 Federal Aid Road Act gave federal government influence over state policy • The interstate system: Congress authorized national system in 1956; now extensive • Federal highway money: Federal gasoline tax 18. 4 cents/gallon • Speed limits: Feds imposed a national 55 mph limit from 1974 to 1995 • The 21 -year-old drinking age: Feds use highway funding to impose on states • Auto insurance: All states require auto liability insurance • Traffic safety: States can set mandatory seat belt laws, set DUI policies • Helmet laws: Federal rule dropped in 1976, some states see issue of personal choice • Driver distraction/texting: Newest safety issue, may be involved in one-third of accidents • Auto safety: Manufacturers have responded, air bags have reduced fatalities © 2014 Pearson Education, Inc. All rights reserved. 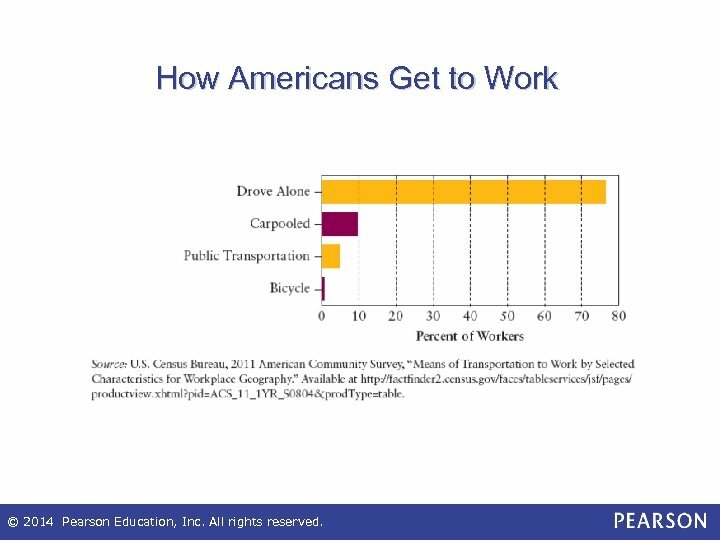 How Americans Get to Work © 2014 Pearson Education, Inc. All rights reserved. 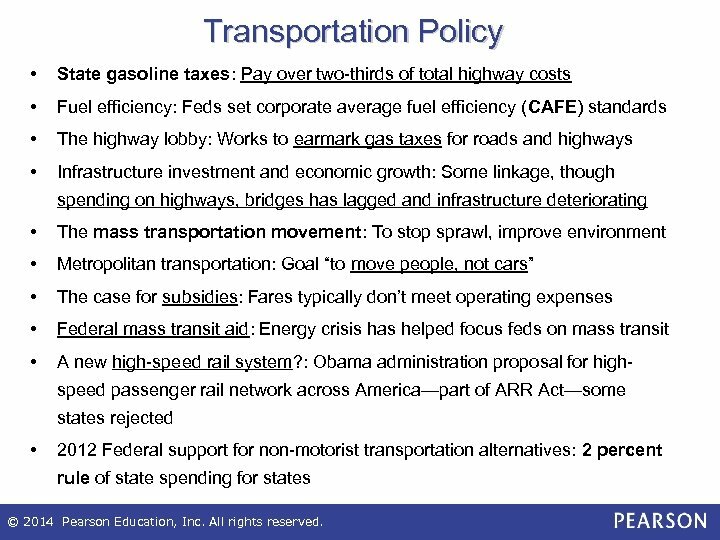 Transportation Policy • State gasoline taxes: Pay over two-thirds of total highway costs • Fuel efficiency: Feds set corporate average fuel efficiency (CAFE) standards • The highway lobby: Works to earmark gas taxes for roads and highways • Infrastructure investment and economic growth: Some linkage, though spending on highways, bridges has lagged and infrastructure deteriorating • The mass transportation movement: To stop sprawl, improve environment • Metropolitan transportation: Goal “to move people, not cars” • The case for subsidies: Fares typically don’t meet operating expenses • Federal mass transit aid: Energy crisis has helped focus feds on mass transit • A new high-speed rail system? 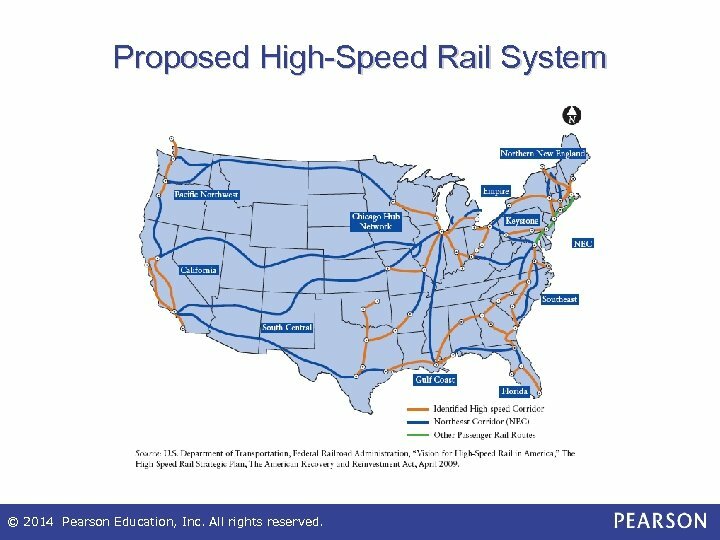 : Obama administration proposal for highspeed passenger rail network across America—part of ARR Act—some states rejected • 2012 Federal support for non-motorist transportation alternatives: 2 percent rule of state spending for states © 2014 Pearson Education, Inc. All rights reserved. 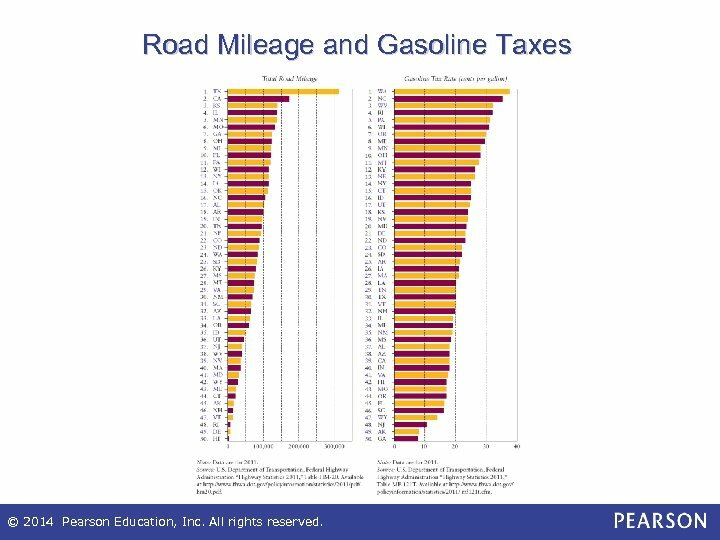 Road Mileage and Gasoline Taxes © 2014 Pearson Education, Inc. All rights reserved. Most Congested Urban Areas © 2014 Pearson Education, Inc. All rights reserved. Proposed High-Speed Rail System © 2014 Pearson Education, Inc. All rights reserved. 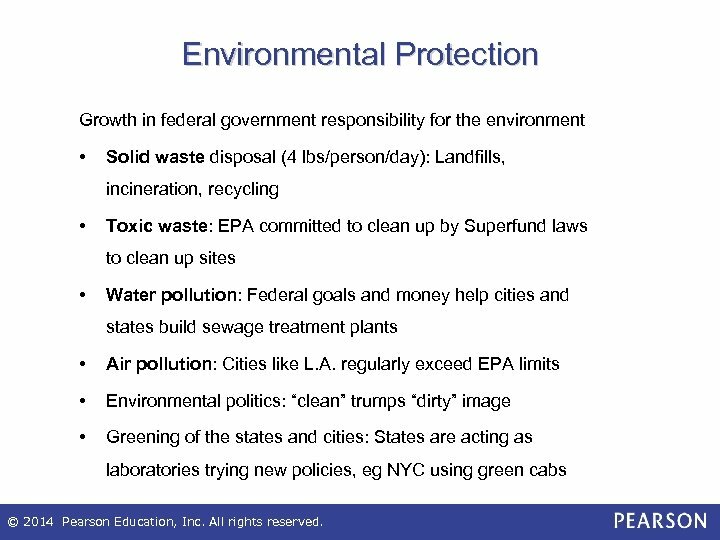 Environmental Protection Growth in federal government responsibility for the environment • Solid waste disposal (4 lbs/person/day): Landfills, incineration, recycling • Toxic waste: EPA committed to clean up by Superfund laws to clean up sites • Water pollution: Federal goals and money help cities and states build sewage treatment plants • Air pollution: Cities like L. A. regularly exceed EPA limits • Environmental politics: “clean” trumps “dirty” image • Greening of the states and cities: States are acting as laboratories trying new policies, eg NYC using green cabs © 2014 Pearson Education, Inc. All rights reserved. 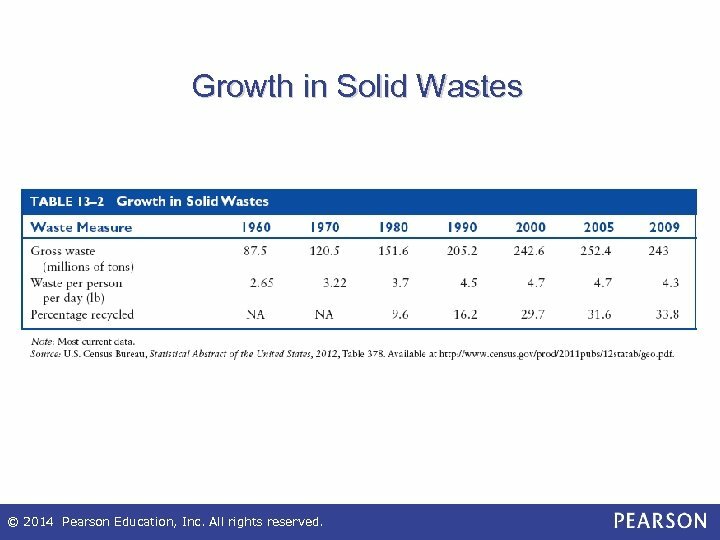 Growth in Solid Wastes © 2014 Pearson Education, Inc. All rights reserved. 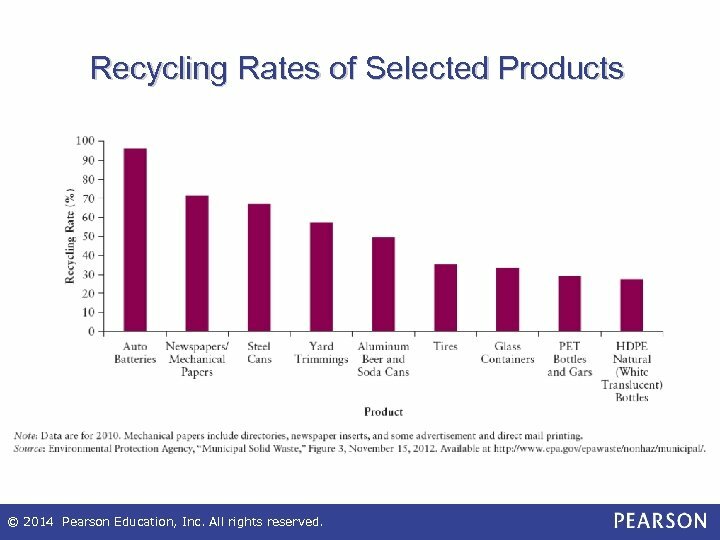 Recycling Rates of Selected Products © 2014 Pearson Education, Inc. All rights reserved. 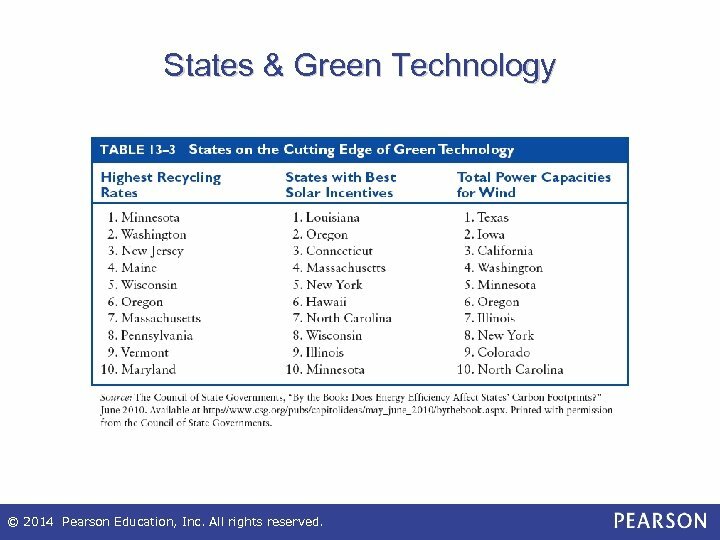 States & Green Technology © 2014 Pearson Education, Inc. All rights reserved. On the Web • www. planning. org American Planning Association • www. hud. gov The U. S. Department of Housing and Urban Development • www. ushsr. com U. S. High Speed Rail Association • www. whitehouse. 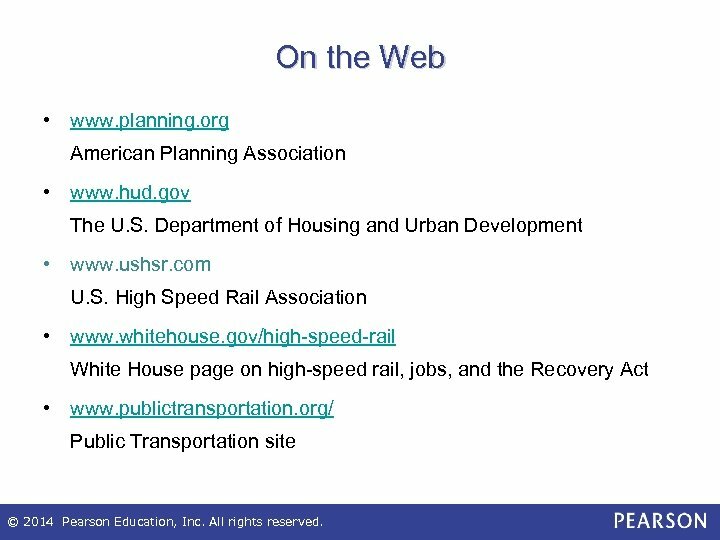 gov/high-speed-rail White House page on high-speed rail, jobs, and the Recovery Act • www. publictransportation. org/ Public Transportation site © 2014 Pearson Education, Inc. All rights reserved.